We’re not sure what you’re supposed to be exploring in this “big and tall” Explorer executive chair, but whatever it is, you’ll do it in complete comfort. The seat features floating spring suspension and thick cushioning, and the depth is adjustable. 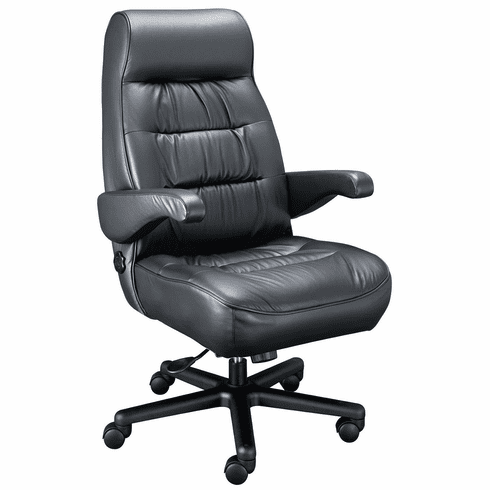 There’s also a rocker reclining seat back with four-way lumbar support. Add to that all the features you’d expect, like pneumatic seat height adjustment, tilt tension adjustment and 360-degree swivel, and you’ve got a chair you can sit in practically forever. And when you’re ready to get up, the arms flip for easy exit. Big and tall people up to 500 pounds will love this chair, and love the lifetime warranty! It’s available in stain-resistant fabric, easy-clean vinyl, vinyl with leather, and even a full-leather option.